The Marquee at Park Place has been one of the most coveted places to live in Irvine for over a decade. Marquee Park Place condos for sale are located in an elite gated community with jaw-dropping, resort-style amenities. These homes are ideal for those looking to enjoy luxurious, maintenance-free living in the heart of Irvine, close to the beach, shopping, and entertainment. They also popularly serve as second homes for those who live in the city part-time. No matter what your needs, the lifestyle that you can have at the Marquee is among the best available in Orange County, California. 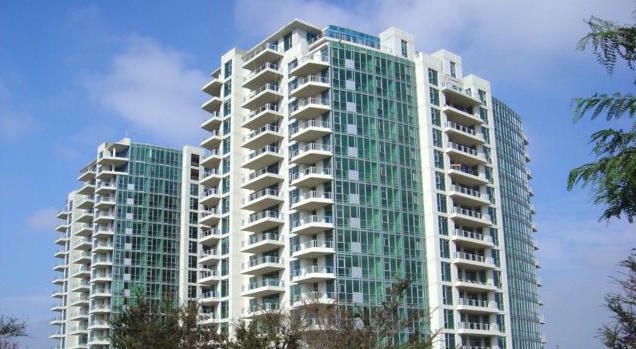 Marquee Park Place may be one of the best, but there are many incredible condos for sale in Orange County. Get full access to all listings and exclusive search features by registering for free with OrangeCountyLofts.com! As one of Irvine's signature condo communities, Marquee Park Place's twin 18-story towers are in high demand from those looking for an impressive condominium or second home. The units in this building provide a variety of features for a variety of budgets and lifestyles, and, since these condominiums have been around for over a decade, many of them feature unique upgrades that set them apart from other homes. You should expect beautiful hardwood flooring at the base of open-concept floor plans, featuring sunny floor-to-ceiling windows to make your home feel bright and airy. Spacious master bedrooms and den or office rooms add to the appeal of these well-designed apartments, and many units feature balconies to help you maximize your enjoyment of the sun. You'll also find breathtaking master bathrooms, often including a spa-like tub and a separate shower, as well as double vanities well suited to couples. With kitchen islands, granite countertops, and top-of-the-line appliances, these modern condos provide every amenity that a savvy buyer looking for a luxury home could dream of. As a luxury residence, the Marquee Park Place includes elite penthouse suites, though these apartments are in such high demand that you'll rarely see one on the market for very long. The majority of the Marquee Park Place condos for sale at any given time will generally be units in the range of 1,500 to 2,000 square feet of living space, providing you with as much space as a modest family home without the inconvenience of location and maintenance. Since these apartments usually have two bedrooms, they are ideal for small families or for anyone who want to have a guest room available at all times—and the second bedrooms can make great offices for professionals who work from home. In terms of price, the longstanding popularity of these condos ensures a competitive market, which also makes these units wise investment properties—you should expect to pay upward of $750,000 for a Marquee Park Place Condo. The Marquee Park Place stands above most Orange County condo communities thanks to its unparalleled level of service, including a 24-hour concierge and a guard at the community's gated entrance. You can enjoy privacy and security at the Marquee Park Place, thanks to camera surveillance and a secure parking complex. Residents also enjoy a number of shared amenities, both indoors and out. Within your building, you can take advantage of a billiard and games room, a media room with a private theatre, a business center, and a fully equipped exercise center. Outside, you can enjoy a resort-style pool with a spa, including an outdoor Jacuzzi. There's also a European-style motor court and a barbecue pit. The Marquee may provide everything you could possibly ask for within its gates, but if you do decide to venture into the outside world, you'll find that the Marquee's central location ensures you'll have access to some of the best entertainment that Irvine has to offer. Right next door, in the Park Place Plaza, you can find upscale dining such as Houston's, or a more relaxed atmosphere in the Panini Kabob Grill's Mediterranean-style café. The plaza is also home to Mother's Market and Kitchen, an upscale grocery store with everything you could need. As you're located right on Jamboree Road, Irvine's Financial Business district is close by, with its many restaurants, shops, theatres, and museums. You're also right across the river from Rancho San Joaquin Golf Course, where you can spend a sunny afternoon trying your skill on the green or just enjoy its country club. If you go a little further afield, you can get to Irvine's amazing beaches in no time, and destination shopping locations like Fashion Island and the South Coast Plaza are minutes away. Finally, with the John Wayne Airport and the 405 freeway nearby, you'll have no trouble traveling in and out of the city, whether your destination is local or international. In short, the Marquee provides much more than an elite, private luxury community—it provides a well-connected home in the center of this exciting city.